RCA, the Radio Corporation of America was not merely a manufacturer of radio, television, and phonograph equipment for home entertainment. The company also made vacuum tubes for all sots of electronic equipment, and produced a weekly radio broadcast called "Magic Key" on the NBC Blue Network. Sticking to their communications roots, RCA today markets televisions, microwave ovens, Android-based tablet computers, DVD / Blu Ray drives, telephones, 2-way radios, radios, clocks, antennas, and many other devices - with no tubes in sight, not even in their TV displays. "Quality," says Webster's Dictionary, "is the excellence of character." Since the beginning of radio, RCA has spent millions of dollars on engineering research in the fields of the electronic art to create and preserve "the excellence of character" that has been built into the hundreds of products that bear the RCA trademark. And so it is with RCA Radio Tubes. 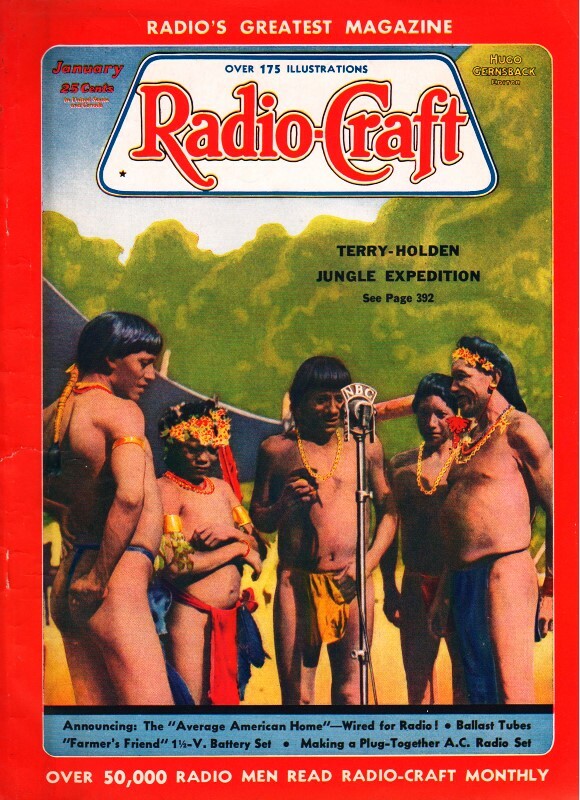 ... that's why more than 325 million RCA Radio Tubes have been purchased by radio owners. 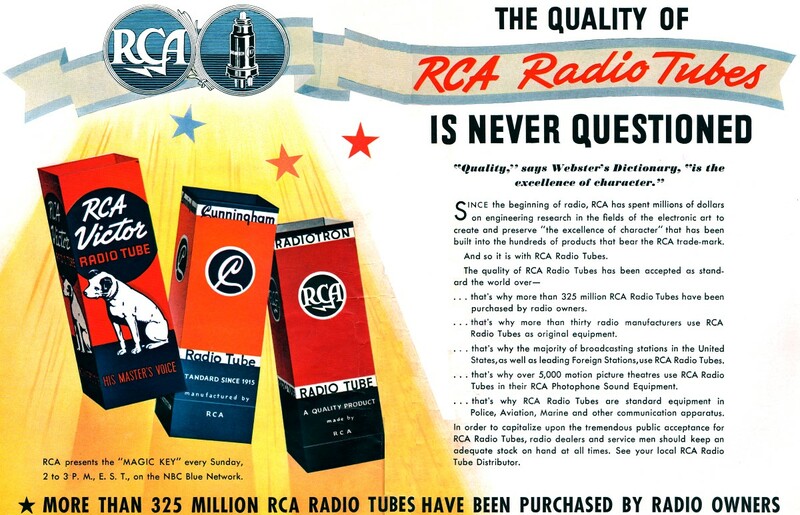 ... that's why more than thirty radio manufacturers use RCA Radio Tubes as original equipment. ... that's why the majority of broadcasting stations in the United States, as well as leading Foreign Stations, use RCA Radio Tubes. ... that's why over 5,000 motion picture theatres use RCA Radio Tubes in their RCA Photophone Sound Equipment. ... that's why RCA Radio Tubes are standard equipment in Police, Aviation, Marine and other communication apparatus. In order to capitalize upon the tremendous public acceptance for RCA Radio Tubes, radio dealers and service men should keep an adequate stock on hand at all times. See your local RCA Radio Tube Distributor. RCA presents the "Magic Key" every Sunday, 2 to 3 P.M., E.S.T., on the NBC Blue Network.